What’s Another 370K Jobs Anyhow? In another sign that the labor market remains weak even as the economic downturn is moderating, private-sector employment in the United States fell by an estimated 371,000 jobs in the July ADP employment index, the smallest decline since October. 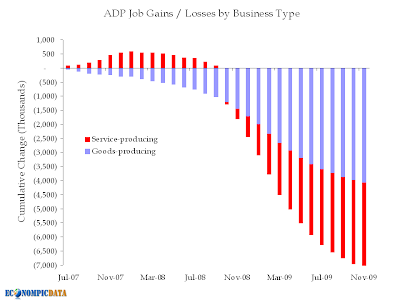 The goods-producing sector lost 169,000 jobs, while the service sector lost 202,000, according to ADP. 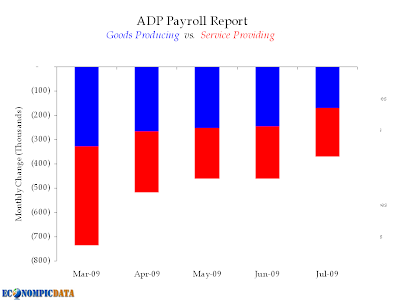 "Despite recent indications that overall economic activity is stabilizing, employment, which usually trails overall economic activity, is likely to decline for at least several more months," ADP said in a statement.